My name is Agnes Balkanyi, I live in Budapest with my family and my dogs. I am the establishing of FCI Barzoi Kennel "TRIUMPHATOR" and the third generation of FCI Schnauzer kennel, "SASVÁRI" ( www.sasvarikennel.hu ). My grandpa, Béla Vadócz is the first breeder of Black Giant Schnauzers and Black&Silver Miniature Schnauzers in Hungary, he is FCI judge on shows and on working too. 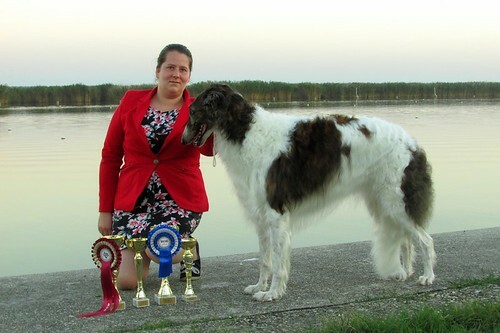 My mom dr. Éva Vadócz is the second generation of Sasvári Kennel, she is a vet & FCI judge. They bred many healthy-, champion Schnauzers over the world. My dad also working with dogs , he is FCI working judge and one from the best trainers in our country, Hungary. More than 12 years ago I seen-, studying and reading about the Barzojs. 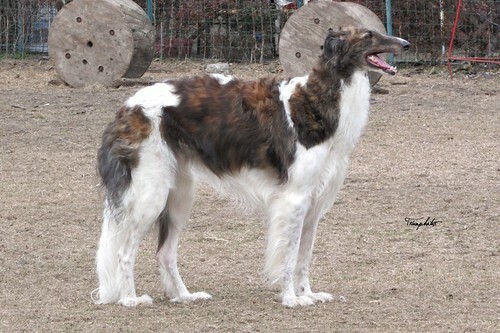 From the first thought (around 2002), that one time I will have a Barzoj, I seen the breed, litters and planning litters. 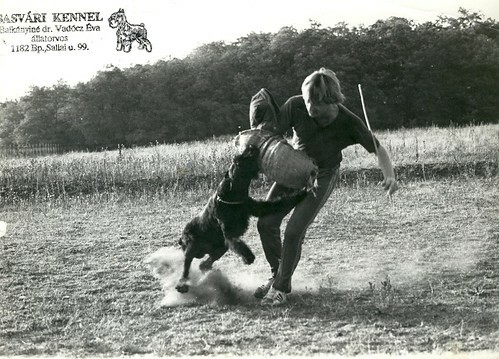 Later I worked with a lovely male on the shows, I knew I needed a puppy from his bloodline. 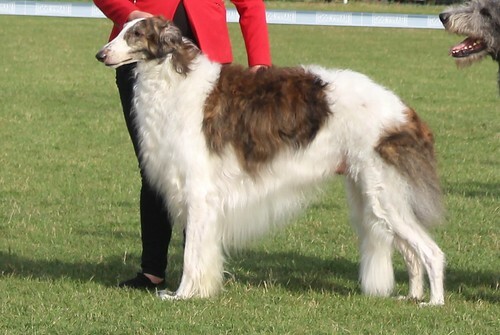 Then I looked the kennels, and I found kennel Cárok Öröksége, which had a very interesting combination on that time: the breeders mated their Ch. Szellőtánc Zakifi Tasha (out of the wonderful red male, Ch. and really successful racer Atamán Imya Zaki & the beautiful Ch. Dober-kopp Dobai Déli Szél.) with the succesfull, C.I.B. french import Voursk de l'Hermitage d'Eole (out of Ruslan St. Rogoff Impérial de Perchinosskaia & Sibelle az Aftab Faizabad.). So, I can't thought, that I will love with CÖ's red "devil" of litter "A". I had the first choice of the litter and my choice is Aphrodite (Samantha). So, Samantha is my really first Barzoj. She is tipical French. She is not big (73 cms height), but strong and muscular, very elegant with a classical Barzoi head, nice long neck & wonderful, energetic flying movement. Samantha have an intesive red color, like fire. She and his predecessors have correct complet toothing. Her character is very interesting, she very kind with us, mistrustful of strangers, she isn't agressive, but she protect the house and us, her family. She was really successful on shows, won Bundessieger, Derby Winner, Club- & Speciality Winner titles and many times BOB and CACIB titles. Also she won BOG and BIS placements and two times won BOS (because she have the best movement) in veteran class. She got her speciality titles from the breed specialist judges, like Mrs. Lisbeth Mach, Mrs. Marie Christine Delabelle, Mr. Guenther Ehrenreich, Mr. Kazimierz Rychlik, Mr. Andras Korózs, Mr. Róbert Kotlár... and more recognized judges from 11 countries. She crowned her show career with the title TOP Veteran Sightound Of Hungary 2017. Maybe her show career is finished but she is our queen in life. Later I had the opportunity to buy a new little sighthound. 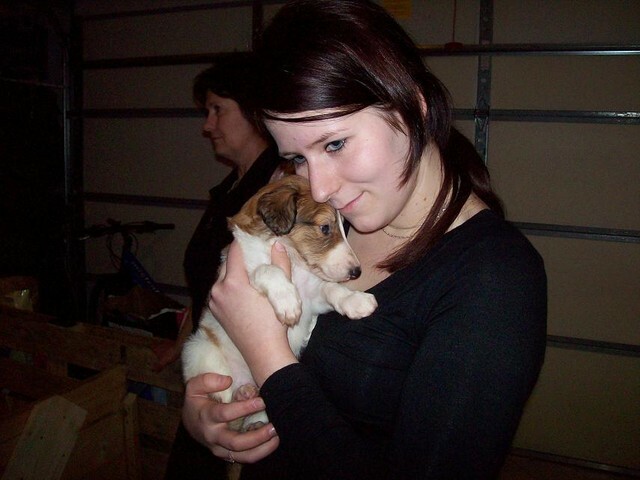 I brought a puppy from kennel Dober-kopp out of DK. Wizzard of Óz & DK. Black Sirocco. She was a funny and happy Barzoi. In this times I helped to Chanel’s breeder, so I can educate my Chanel since her 1 month old age. Chanel is a little girl in a very big body with very very big heart and lots of love. The most important of her is her owner, if we are somewhere: she listen just me. She is a true love-bomb, affectionate and obedient. And she like „hunting” and fraternize with every peoples and every dogs. 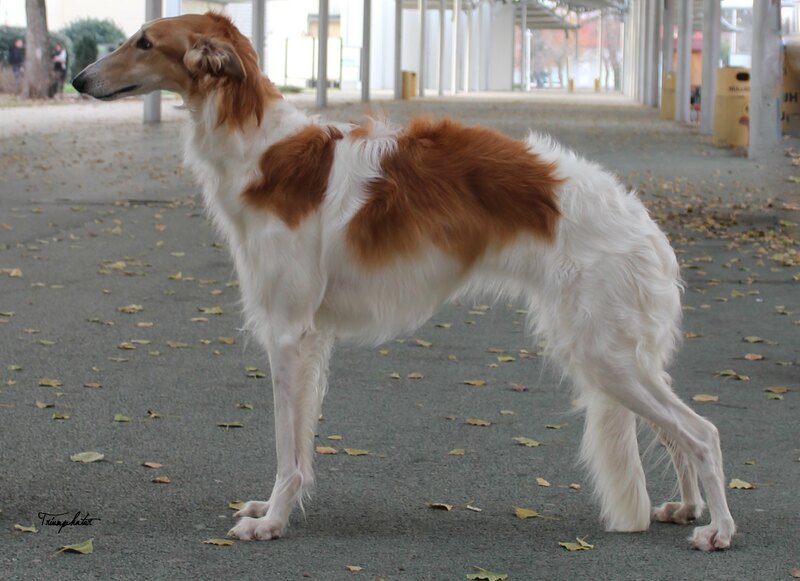 I think she is a Golden Retriever in Borzoj body. She was my shadow on everydays, but very very sadly that she was died on 23th of September in 2017. She was very young, only 5 years old on that time. She died in sudden cardiac arrest. In 2013, a dreams came true! Our first litter was born on 11th of April, 2013. The puppies represent my favourite Barzoi type. The true ancient Barzoi type with a little french elegance. They have excellent strong bones, they are not so tall, but so strong, an elegance- long neck, a classic Barzoi head and elegance movement. They find the absolutely perfect loving owners in three different country. They made great work on the dogshows, what I did not dare to dream... 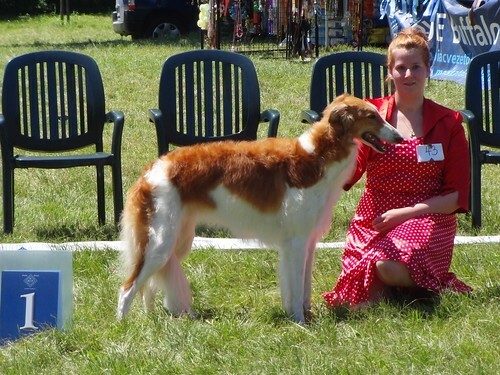 They won more than 20 Best In Show placements and many nice placements in the other competitions in the main-rings in four different countries high quality shows, like German Borzoi Yearshow, Swiss Clubshow, Dannish Sighthound Show, Donaueschingen Sighthound Festival and Hungarian Speciality- & Clubshows... I am so proud of them. But the most important, that they live really happy and healthy life with they fantastical families. Our Z-angels' parents are the absolutely amazing DWZRV JCh. Ladianov aus dem Zarenreich & my successful IntCh. Samantha. I kept two puppies from this litter: the big-bear-boy Triumphator Zophiel aka Zozito and the energetic bomb Triumphator Zarina Zelebsel. I am very thankful to Ladianov's breeder & owner, Mrs. Margrit Klug and our friend, Mr. Asztalos Árpád! 2017. For the second litter I am again choosed an amazing male who born in Kennel Zarenreich. He is Multiple Champion and Multiple Winner Razumov aus dem Zarenreich he have perfectly healthtest results also like Cardio free and DM N/N. I choosed him in 2015, but we planned Our second litter to 2016/2017 winter- and they born on 16th of February. Ten amazing-, strong- and healthy puppies, 4 males and 6 females. From these lovely BBs five live in Hungary, three live in Austria, one live in France and one live in Switzerland. I am very proud that they have nice show results (more than 10 BOB, 5 BOS, 10 Best Junior, Junior Speciality Winner and Slovenian Junior Winner, Baby&Puppy Champions and Best Puppy on WDS'17, BOG and BIS placements..etc titles) at they very young age. I kept only one female from them, she is HJCh. Triumphator Yarkaya, who very similar to her granny, Samantha in inside and outside also. I am very thankful to my mom, dr. Eva Vadócz, who help to us everytime when we need!